Saturday, January 20, 2018 – BOOKWORKS -NMJACL Board Member and author, Cynthia Grady, has had her latest book published and on store shelves only days ago. 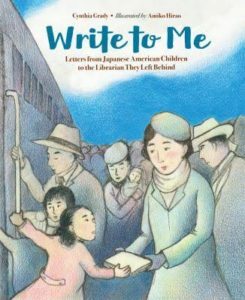 See the attached announcement and article in the November 2017 issue of the Sagebrush Shinbun for more background about this wonderful book that captures actual letters from children who were incarcerated in internment camps, particularly in Poston, AZ, during WII. Cynthia will be at a book signing event ~ stop by to meet her in person if you are in the area ~and wish her a huge success!